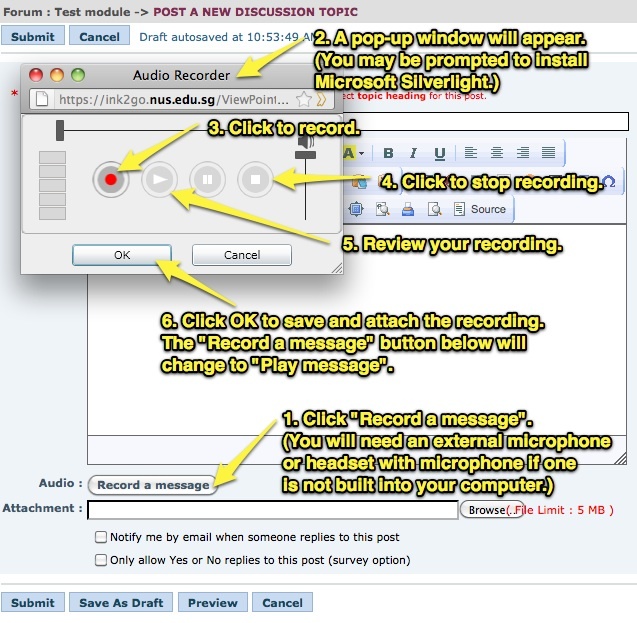 You can now record audio messages directly in IVLE Discussion Forums. This is useful especially in language courses or other courses which require audio input or feedback. A pop-up window will appear with the recording controls. If you have not installed Silverlight, you will be prompted to do so. Click the Record button. Start your audio message. Click Play if you want to review your audio message. Click OK to save and attach the message to your forum post. The Record a message button turns into a Play message button. You can still delete the audio message before posting. 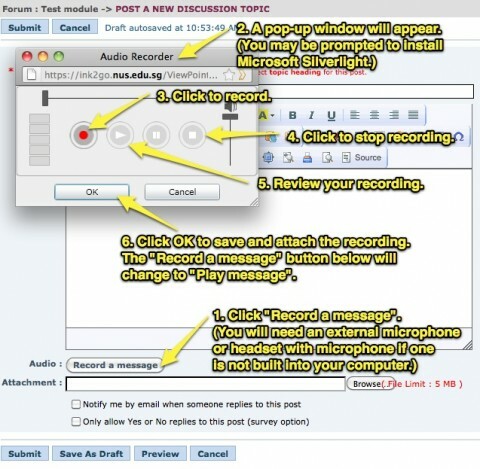 Readers will see a Play Audio Message link in your forum post. Posted in What's New and tagged IVLE on 7 September 2011 by Kenneth PINTO. Please use a non-NUS email address to subscribe. Opt out at any time. Opinions and views expressed here may not represent the official views of the Centre for Instructional Technology and the National University of Singapore. The author(s) link to various resources and are not responsible for the content of external websites.